I heard recently that the CD is dead. Main stream music producers and publishers are no-longer manufacturing hard copies of music for in-store purchase. If you want to buy Lady Gaga's music, you'll just download it on iTunes. This is a bummer for me, and not because I make soooo much money designing CD covers. It's because the more you can engage a person's multiple senses, the more likely you are to make an impact. Cover art caters to people who think in pictures, and engages another sense by injecting imagery into the mind of the listener. It motivates them to listen differently. It gives them a visual to associate with your music, which makes YOU more memorable. Fortunately for me, dulcimer players tend to play for audiences that are more likely to buy a CD than they are to go out to iTunes and download it...for now. 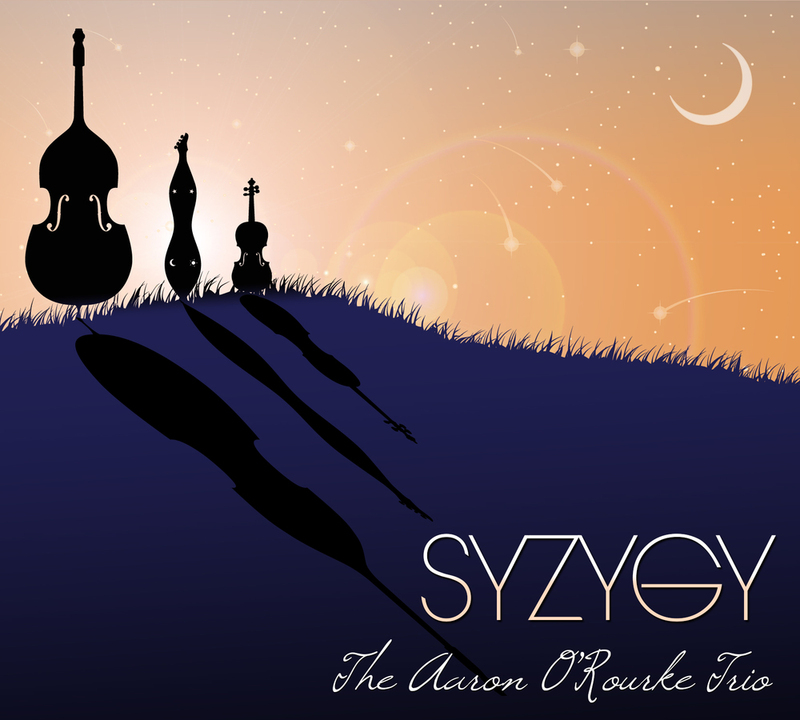 In February of 2012 my friend Aaron O'Rourke asked me to design cover art for his latest Trio CD. Aaron is an outstanding mountain dulcimer player and an all around phenomenal musician and human being. If you play the dulcimer and are familiar with him, you already know this. If you are NOT familiar with him, you should be. Aaron recorded a collection of tunes with Erik Alvar (Bass), and Katie Geringer (Violin), also known as "The Aaron O'Rourke Trio". It was really an honor to be able to play a small role in the production of this CD. The CD is called Syzygy, which is basically the alignment of three celestial bodies. At first I thought the name might not be a wise choice because it's hard to pronounce. But then I listened to the music, and most notably, the title track. It's beautiful and every individual part is unique. Through all the syncopation, harmonically and rhythmically the three instruments manage to remain perfectly aligned. This is what ultimately inspired the cover art. Aaron's direction was fairly vague. He said, "I don't want a photo on the cover...and Erik doesn't want anything too outer spacey." So, I had a lot of freedom. I'm pretty sure the only reason they didn't go with it was because I spelled "Syzygy" wrong. I'm betting Kevin Spacey would not have minded the massive amounts publicity he'd get from being on the cover of a dulcimer CD. All joking aside, I spent a lot of time listening to the rough cuts of this album and brainstorming how I could do it justice in cover art. Eventually I came up with 3 concepts and it got narrowed down to one. I wanted to continuously show alignment in this design, both figuratively and literally The instruments are aligned with one another. The viewer/listener, is aligned with the musicians, and the sun is representative of the music. I continued this theme with the actual disc printing by creating sort of an eclipse type thing. I also went ahead and included a little diagram to illustrate the meaning of the word "Syzygy". This way the trio can refer to it when trying to explain their album title to audiences. I don't know that they ever would do that, but at least they have the option. Check out the CD HERE! On a side note, my spell-check does not recognize "Syzygy". It wants to change it to "Zymurgy", which is like, the scientific study of fermentation...for brewing and stuff. I think it would be funny to drink a bunch of beer and record a drunken CD, then name it "Zymurgy: A musical study of the fermentation process." Funny, that is, if someone else were to do it. Any takers?